Well, I'll call it partial success. Punch a storm, come out in perfect position, I mean perfect position, and still miss the ground contact. Oh well, I learned a lot from this chase, and I won't make the same mistakes again. I chased a small storm that fired on the boundary from Hector to Litchfield, but it never did anything and I turned around to head west. By now I had given up on the Worthington target. I know it sounds corny, but I had a "feeling". 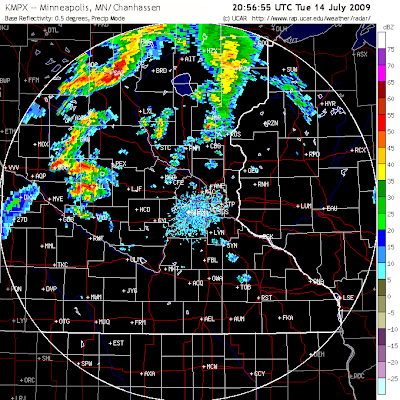 Can't describe it any better than that, so I started driving west and noticed a few blobs pop up on radar just west of Willmar. They looked terrible, and weren't doing anything but it was better than anything else so I committed. 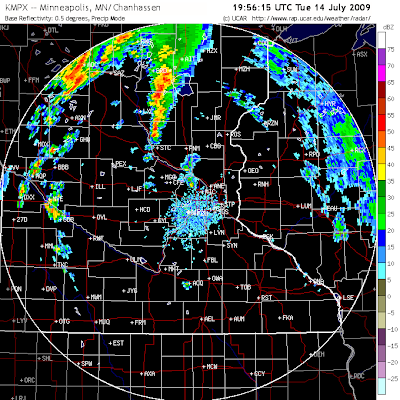 Pulled up 5 miles south of Willmar and the "storms" still looked terrible on radar, just a disorganized blob of junk. 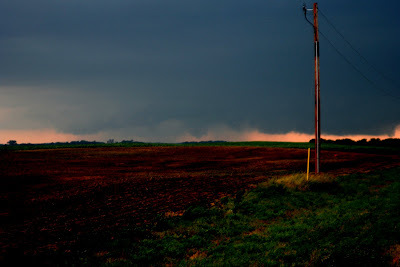 However one updraft already had a wall cloud and funnel! The day was suddenly looking interesting. Here's where I made my first idiot move. 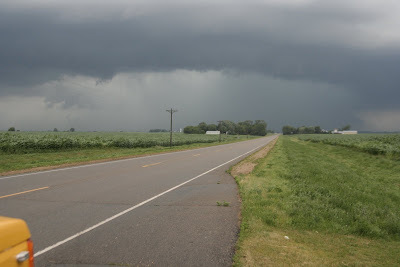 Instead of hanging south and staying with the wall cloud, I thought it would be better to get through Willmar and out of traffic so as to get on the storms north of town with better road options. I drove into town... only to have the storms ramp up almost immediately and chase me all the way through Spicer before I was able to get ahead of them out of the precip and turn east and south. 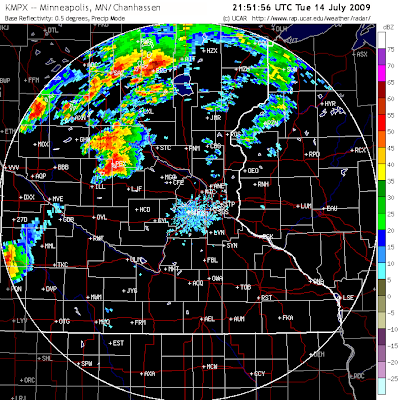 See that small storm just to the southeast of the Willmar storm? 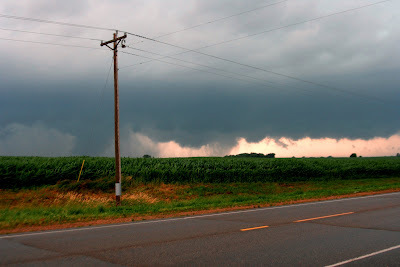 I watched it literally get sucked into the Willmar storm as I was being chased down Highway 23. The storm went from junk to pretty decent looking in 10 minutes. Oh, and that storm to the northwest? 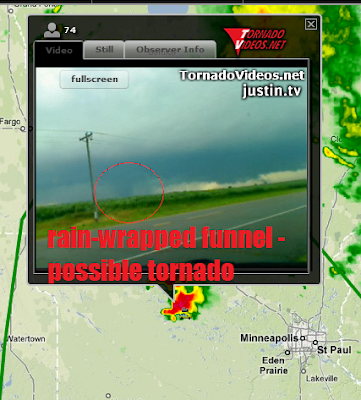 It was producing a big tornado over Swift Falls at the time. I was so focused on the southern storm I never even noticed this one. 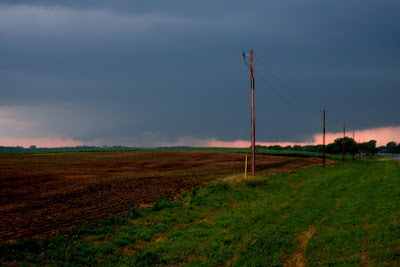 As I pulled out of the precip the wall cloud immediately was right there to my southwest. Big wall cloud, dancing vortices all over the place and a rather large funnel. No way I could see if it was on the ground. This is where I made my first two SN reports, ever. The entire wall was spinning really good and I didn't see any other reports so I took the time to write them up. You can see the RFD cut already punching in here, and here's where I made the mistake I wish I could have had back. This position was about a mile west of the southern shore of Green Lake. I figured I was good for a while, but then the RFD really surged and the storm took a turn right at me. I'll admit it, it freaked me out, especially since everything was wrapping in rain and I lost visual on that funnel. I chickened out and backed off a mile and watched the rest of the show. Turns out had I stayed right there I would have had the view of a lifetime and some epic footage. This haunts my dreams every night... The tornado passed within a half mile of my first position... FAIL. The last radar grab tells the story, from junk, to decent looking, to this nice storm in about 30 minutes. You can actually see Green Lake in the grab, and the hook of the storm all wrapped up in precip. Maybe someday I'll get over this, for now I'll just keep bashing my head against the wall until I get tired of the squishy sound...On the ground here, doing damage along the south shore of Green Lake, REALLY close to my first position... All wrapped up and the end of the show for me.